Linked Lives: A Memoir of an Extraordinary 40-Year Friendship by Bonny Brooks is the story of the friendship between Bonny and Lori. They met in their teenage years and their friendship carried on throughout their lives. Even though their lives took opposite directions – Lori stayed in their home town while Bonny moved from place to place several times – they always found the time to call each other. Through their phone conversations, readers find out what the two friends have been through, from love life and raising children to career choices, family events or bereavements. Their lives couldn't have been more different yet they shared something extraordinary: a lifelong friendship and unconditional love for each other. While Bonny graduated high school and then went to college, Lori gave up school shortly before graduation; while Bonny failed to find “the one” in her life, Lori had a happy second marriage after divorcing her first husband at a young age and struggling to provide for her two infant children for several years. Their friendship was not built on their differences, but on the capacity to understand each other’s choices and be happy for one another, and sharing their most intimate thoughts and feelings without the fear of being judged. And this, in my view, is true friendship. The book Linked Lives: A Memoir of an Extraordinary 40-Year Friendship by Bonny Brooks is enjoyable to read, even though you might shed a tear or two along the way. But the two life stories will bring sheer joy as well to any reader. The story could be the story of any friendship and this is the powerful message of the book. No matter what kind of life you have and whether you'll find “the one”, go to college, have a career or raise children, if you have a Bonny-Lori kind of friendship in your life, you can conquer anything, from illness, poverty, and addiction to achieve happiness and fulfillment. 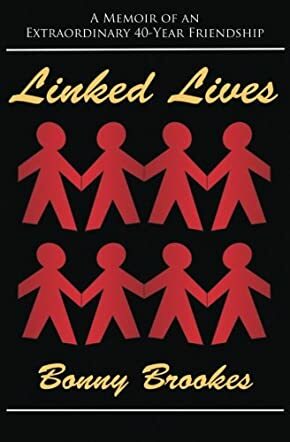 Linked Lives by Bonny Brookes is a comfortable read. It takes a walk through the lifetime activities of two young ladies, namely Bonny and Lori. How they met; how life blessed as well as tested them. Good friends are hard to find. True and trustworthy: these are traits that few exemplify. Bonnie and Lori find them in each other. Each trial in their individual world is reduced in complexity as they share and seek guidance. Good times, as well as bad, are borne with greater confidence, knowing they have emotional support in a friendship that many do not have. Lori’s marriage and her children provide Bonny a peek at her dream for life, one that has eluded her. Be it because of wrong choices or by mishap, Bonny can only look on with longing. In life, they each provide the other with an emotional crutch on which they can rely. There are excellent life lessons exposed, showing how critically important it is to listen, love and care. Honesty and integrity show in the many examples of trials, disappointments, and joys. Ultimately, the story shines as a bright light into the recesses of the mind, and exposes wisdom and discernment as each woman does her best with what she has. Interesting, yet somewhat poignant, I would recommend it. Linked Lives by Bonny Brookes is a non-fiction book about the lives of two wonderful women and the beautiful friendship that they shared. Bonny and Lori's friendship began when they were teenagers, and grew stronger as they grew older, remaining best friends for the rest of their lives. Even though they chose different paths when Lori decided to drop out of school, they never let this get in the way of their friendship. They were there for each other through thick and thin and each knew that they had a friend they could confide in and turn to for advice and comfort. They were always there for each other during the difficult times and there to celebrate each other's good news. Even when they lived thousands of miles apart, the friendship still survived. In her memoir, Linked Lives, Bonny Brookes talks about her life and the beautiful friendship she shared with her best friend, and how this friendship helped them survive many challenges. What makes this friendship even more special is how the two managed to remain so close while living thousands of miles apart, in an era before mobile phones and all the other forms of modern communication technology that we now enjoy. Even when they did not talk for many months, they still remained as close as before and there were never any awkward moments the next time they talked. Bonny showed me that you do not need to be near someone to be there for them when they need you. Her memoir tells a beautiful life story, with all life's challenges, tragedies, and triumphs, and I loved reading every single page. I've lived in Saginaw Mii all my life and worked at the High school Bonnie refers to...also remember well the Alibi and the yellow brick farm house is still standing. Good reading.